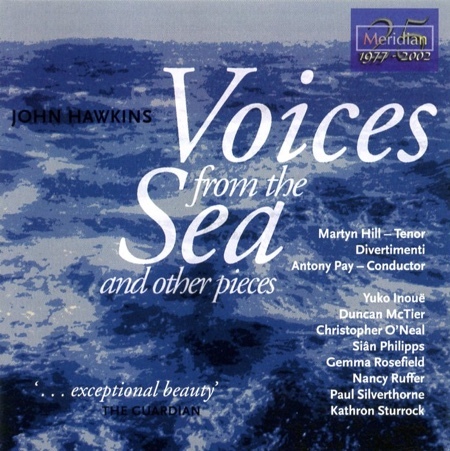 Voices from the Sea released by Meridian Records and available on iTunes, includes ‘Voices from the Sea’ with tenor Martyn Hill and the string orchestra Divertimenti. Full reviews here . . .
Urizen was recorded by Paul Silverthorne and John Constable on Black Box Music with pieces by many distinguished composers commissioned by Paul, including Anthony Payne, Richard Rodney Bennett, Elisabeth Lutyens, Colin Matthews, Robert Saxton and John Woolrich. The CD is currently not available, but may return! Cortège? is available on Meridian Records ‘Homage a Lorca’ together with pieces by Poulenc, Falla, Cecilia McDowell and others. Sortie (for Trumpet and organ) has been recorded by Deborah Calland with William Whitehead, organ and is available on their CD ‘North Star’ on the Deux-Elles label together with other contemporary works.